How Important Is Burping your Baby? Feeding a baby is an exciting experience for any new parent. 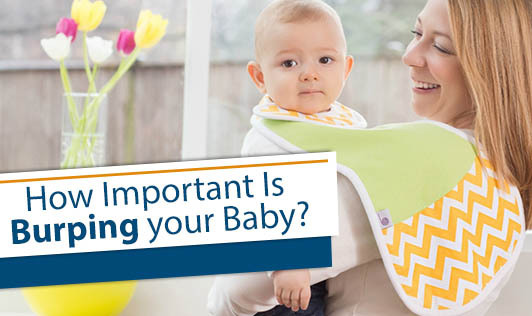 Similarly burping your baby should be as important as feeding is. A baby's burp can sometimes concern parents. Burping a baby can reduce spitting up and relieve bloating caused by swallowed air. Burping positions: There are 3 common positions to use when you begin to burp your newborn. It is important to remember that if you are not getting the desired results from one position, you need to try another. Over the shoulder position - It requires you to hold your newborn firmly against your shoulder and apply a patting or rubbing motion with your hand on your little one's back. Walk around slowly, leaning the baby over your arm until the baby burps. The face down, on your lap position - This requires you to place your newborn on your lap with their head resting on one leg and their stomach over the other leg. You must support the baby with one hand while you apply a patting or rubbing motion or gentle pressure on their back with the other hand. The sitting up position - This requires your baby in your lap with his/her body leaning forward. Support the chest and head with one hand while you pat your baby's back with your other hand. There is a wide age bracket at which babies stop burping. If your baby is between 4-9 months old, and does fine without burping, then you can simply stop trying to burp the baby. Every baby is different. You need not feel a sense of failure if your baby doesn't burp at every attempt. Be patient. Sometimes burping takes several minutes!